Well folks. It's been brief but awesome. The Tabletop Tacticians boys have been awesome hosts and have definitely infected me with the Flames of War bug which I'll now take back with me to Calgary where I hope to find like minded dudes to play games against. 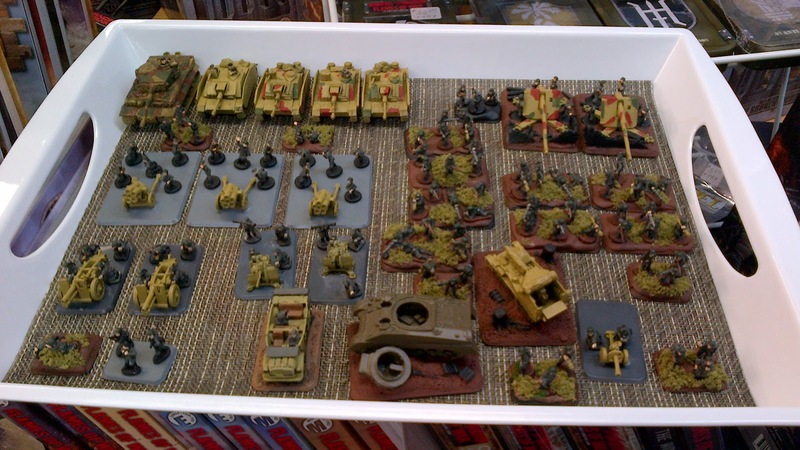 In the meantime, and an effort of some shameless self-promotion, I'll be posting my Calgary-based adventures in toys soldiers over at my new blog Clockwerk Warriors. I'm hoping that with the blog I'll be able to help support the existing FoW community out Calgary way and maybe create a bit of a dialogue between the Calgary and Ottawa crowds. The FoW community in Canada is small, after all! Feel free to check me out. 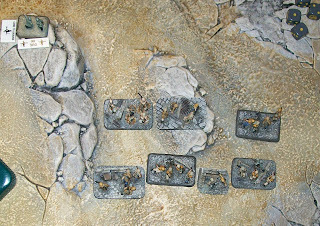 I'm hoping that I'll be able to make it back to February's Game Summit and participate in the Flames of War tournament there! Thanks folks, it's been awesome! 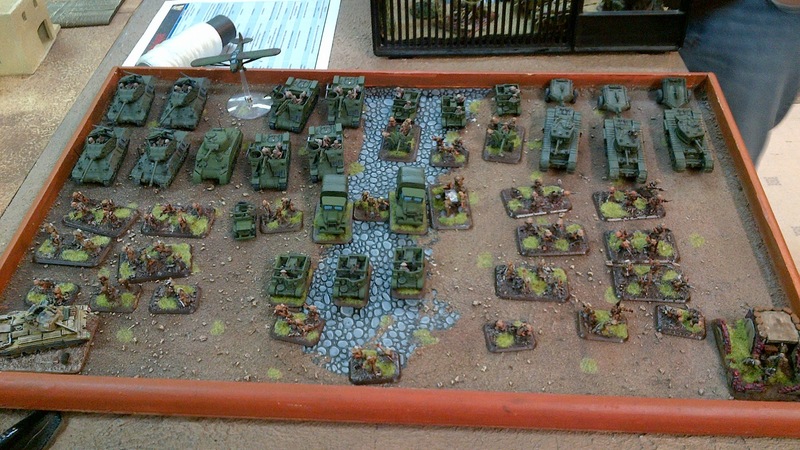 I snapped some pics of everyone's army at BattleCry 2011 - Here are the 16 that turned out - ENJOY! 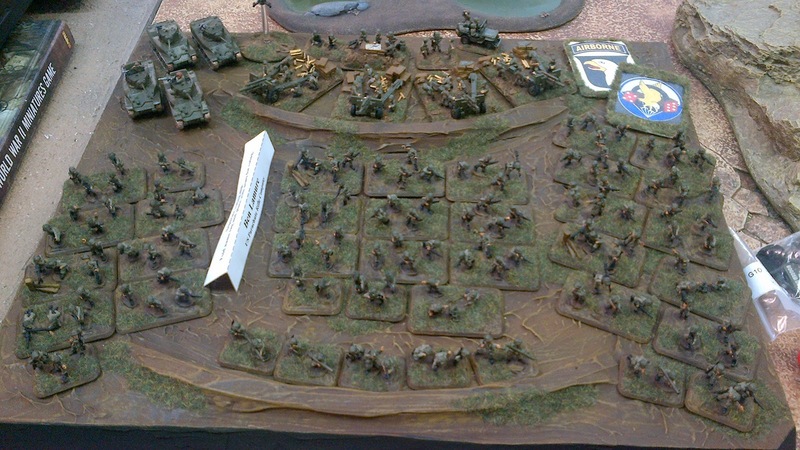 Serge's Feldherrnhalle - took home best painted! I forgot to get a shot of my own, and I can't for the life of me remember who else I missed - apologies! For more pics, visit http://covering-fire.blogspot.com/ , Drew's awesome FoW site. However, only the video below shows the 'Narnia' room, for the Magic players!!! Must See. Hey guys, just got back from BattleCry, and while I thought maybe there was SOME hyperbole when told that this store has EVERYTHING Flames of War, I can tell you.. if its available, they have it. Sadly for my buddy Diragi, they didnt have the dice tin he was looking for, since they arent making a bunch of them as it turns out.. I was hoping for some 21 Panzer tokens... but to put it in perspective.. if someone were to buy, lets say 5 blisters of Panzer IIIGs, he would have 2 left on the peg!! He not only had my french bathtub halftracks, he had the Pio versions (Somua Halftracks, so less bathtub) and the AA versions, and the PAK40 versions.... yeah. Twin finally was able to score his deuce-and-a-half trucks. 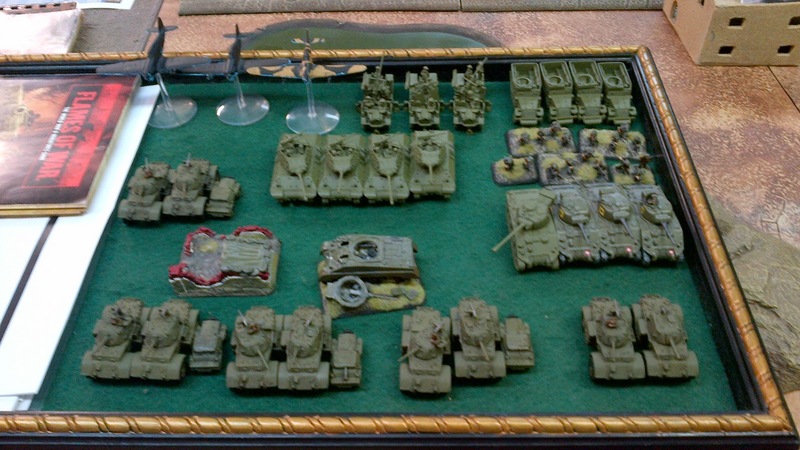 If I wanted DD Shermans, I'd have to decide between screen up or screen down versions.. they had pretty much everything. It was cool to see folks like Manidow and Ukmog, a few OMG guys, and the Petawawa guys filled out the rest. (above) Tristan Ca$h plays against Dan's LuftwaffeFeldKomanie. Dan says that he spent more than twice on Defences than models, in MW he uses a lot more apparently. Ill put in my tourney report here, the others can post below with their experiences. I did shockingly well, first game I faced a Panther/Stug?Marder tank list, and couldnt hit anything at all. I eventually killed the 4 Marders, and while I nearly had the game in the bag thanks to trickery by my Recce Patrols, Alex knew his stuff and played well, and got the 5-2 againts me. Game 2 faced the all Stug list. Encounter. 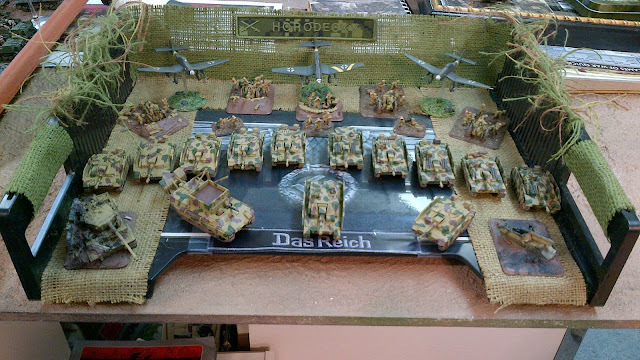 He had Stugs, Stugs, HQ Stug + Berge, 10.5s, Stukas, a KGrupped other unit of stugs I think, or he ran 3 units, not sure.. but we were on the city fight board, with 5 story row houses everywhere. I was able to use the roads to get my Recce Patrols in a position to assault his 10.5s from the flank, so no Defensive Fire. 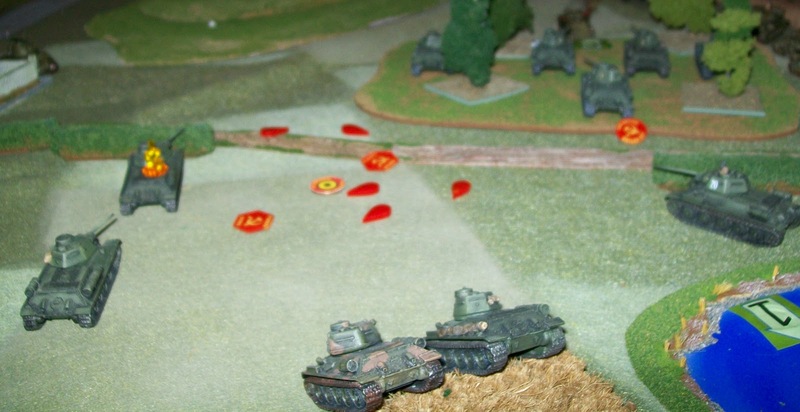 After wiping them out, I moved onto his objective, and his 2 live stug platoons were too far to get there in time. He rolls for his reserves, gets his last StuG unit, but sadly, with scattered reserves, they came in on a far flank. So it was up to his HQ StuG, but he only bailed out my Recce, and thus I won, 6-1. Crazy part is, if they had come in the middle, he would have crushed that platoon, he had me down to 1 stand in one platoons, so I would have had to Man Alone test him, and 1 of my gun troops was down to one gun, but they passed motivation. So, really, but for scattered reserves, one more turn would have lickley been a 4-3 loss for me! 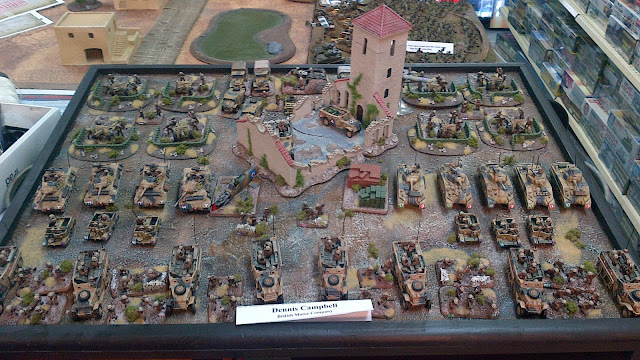 Game 3 was vs Serge's Feldherrenhalle SS tanks. 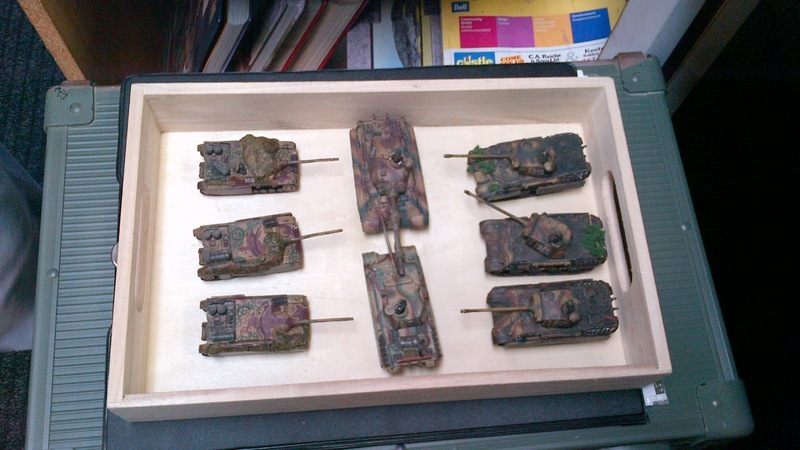 He had: Panther HQ, possibly character, not sure, 4 Panthers, 3 IV/70s, and 1 King Tiger. 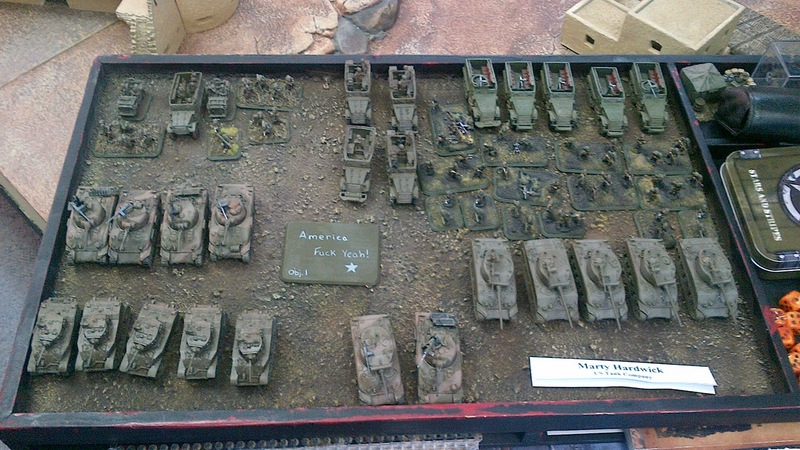 However, it was breakthrough, with him attacking, and he has 3 platoons and cannot KGruppe due to no 2IC. The way the terrain was, and that I had both Shermans and M10s in reserve, he elected to keep just the HQ and IV/70s on the board, the rest to come up on my side onto the corner objectives. My 25pdrs finally kill a model this tourney, and pop a IV/70. he is barreling to my objective, my measly 6 guys is somehow to hold a KTiger and 4 Panthers.. but his turn 3 he gets no reserves, tries to hide his IV/70s in case I get lucky and get my M10s. I get lucky. Get my M10s. Kill another IV/70, he fails platoon;s test on a 2. Turn 4, Fails Company Morale on a 1. He has no platoons on the board, and one destroyed, so I win the game 6-1 despite only killing 2 tanks. Crappy way to win a game, but I'll take it. Serge and I shot the breeze, and it turns out he used to work with my dad when he was a weapons engineer for the interceptors my dad used to fly in Quebec. Small world. Turns out the guy who had tournament lead going into round 3 lost massively (thats why you dont run all Staghounds Tripple!) and thus I was able to win overall!! 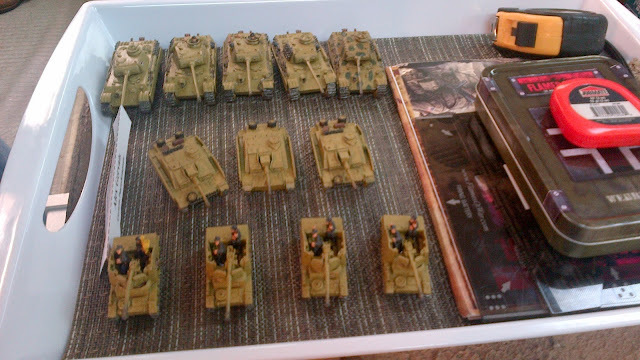 So, despite killing a grand total of 11 models all tournament (4 marders game one, 4 guns +staff table game 2, and 2 IV/70s game 3) I was able to pull it off with massive luck! The example above of Panzer III's was what I got as my loot... so I now offically have the models to run Brits EW-MW-LW and Germans EW-MW-LW. Im pretty stoked. Clockwerks picked up best sports, not sure if Dion from OMG got General, he might have, so all-in-all a good day for the Ottawa boys! The bad part is, I think my card is screwed because I lost about 5 minutes of footage. I have about 5 minutes left, which will upload tonite, and I will post tomorrow morning. So Lothlann, Clockwerks and myself got together for some Warmachine, and we played a 3 way "Mosh Pit". Please bear with the video and our play, as we are still learning the rules. It really is a nice change, and we enjoyed it immensely. The WWPD guys always say, "Don't blame the dice" but in this case, I had to seriously consider buying a new tin of dice, this being 2 days before the BattleCry Flames of War tournament. However I opted to stick it out and see if I could salvage a point or 2 by killing platoons. Tristan ran a Bake list with Tigers, Panthers that could Recon, Nebs and a small unit of Gebirgsjagers. No Retreat, with me defending. Enjoy the video. Turn 4 file was corrupt, scroll way down past video for spoiler / turn 4. As you can see, I seemingly shafted myself with my objective plascement, but I knew that as defender, I get to Ambush, and I have M10s. When he decided to recce move the Panthers and not the Tigers, I was super happy, since I knew flanking shots would murder Panthers and bounce off/bail Tigers. I had placed my objective in the open, but close enough to the tank factory that a dug in squad of Motor Platoon could defend until more reserves arrived. I double timed Shermans up the opposite flank turn 3 when they came in from reserves, knowing they couldnt touch the tigers, but my goal was the Gebirgsjagers and the Nebs. Turn 4 which isnt on the vid, I got unlucky, failed to kill the Faus guy, and figured I'd defensive fire if he assaulted me, which is exactly what he did. 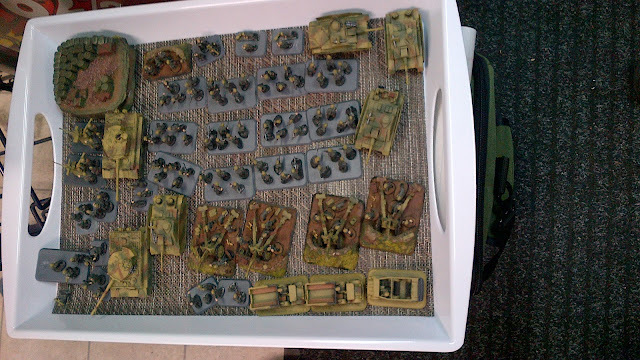 I killed them that assault phase.3 Shermans plus 2 OP Shermans with their hull MGs I thought would decimate them, which they did it just took longer than I thought, while I was hoping to keep feeding units to contest that objective, even with recce if I had to. So that was the game plan. 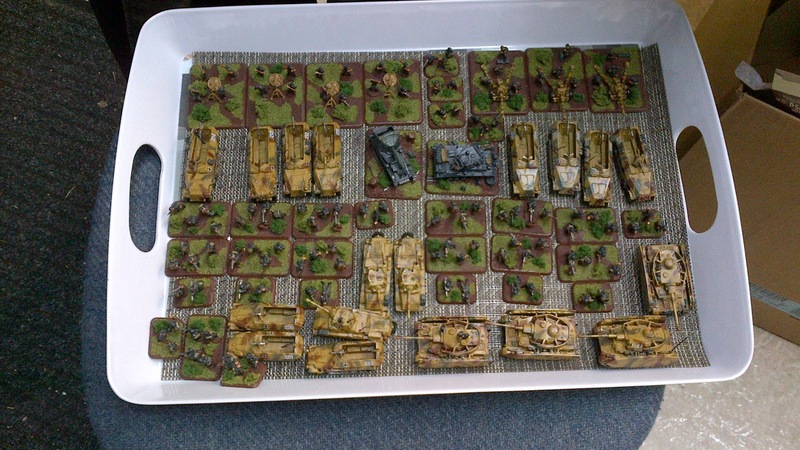 Well, this is my painting blitz completed, with a mighty 2 days to spare.. 1500 points, Late War 1st Bn, Argyll & Sutherland Highlanders. This is what I am taking to BattleCry, assuming nothing breaks on the drive up! Since I am trying to pack into a smaller case, I have everything else that is painted but not using on my table.. and it is below. 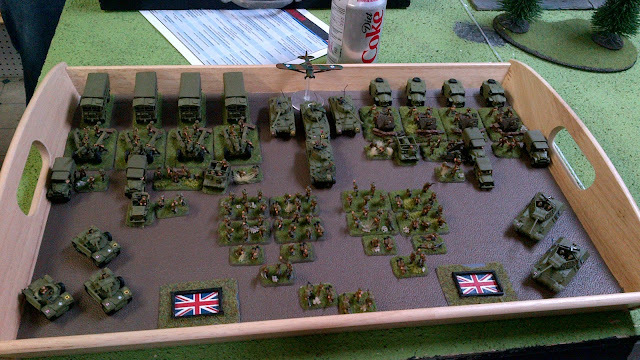 Staggering amount of Brits.. plus I have a BAR army box and 6 Grants to do to finish out. Duane and I couldnt make Friday Night Fights, so we decided to hit up the OMG bi-weekly gaming session. 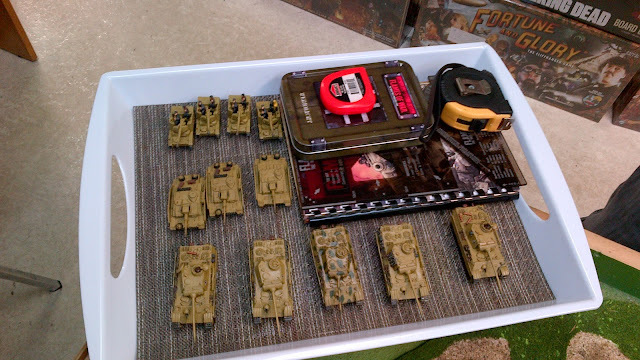 We played some Flames of War, but here are some pics of other games going on. 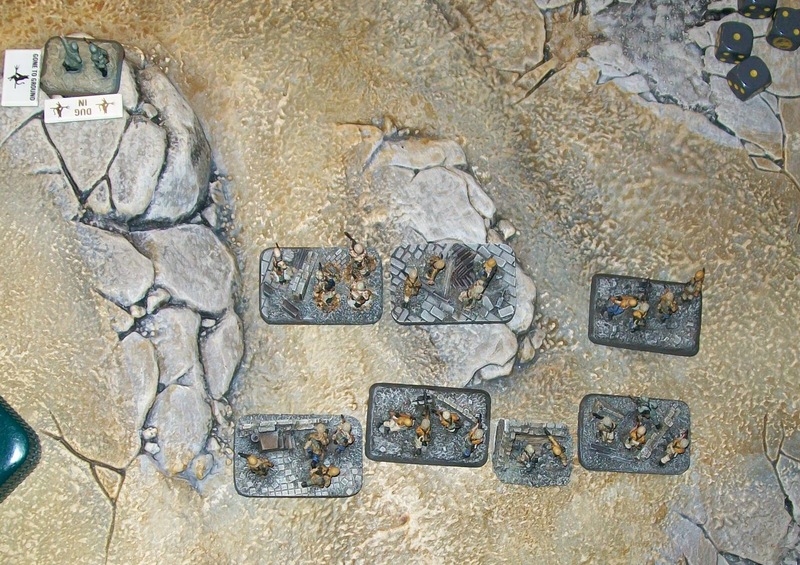 Above is a 15mm Samurai game, played on a 4 foot table. 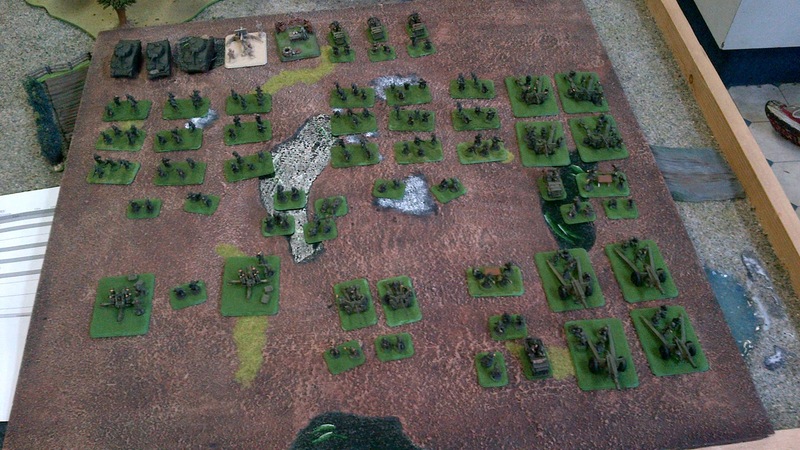 Below are some shots of a 10mm (maybe 6mm) WWI game called Bloody Picnic. Call me crazy but I expected trenches, machine gun nests, and artillery. Duane and I played No Retreat, since it is in the mission pool for BattleCry. Video of that game is at the bottom. Enjoy. Newly painted FSJ arriving from reserves. No Retreat with Soviets on the attack. So its been two weeks since the 1500pt OMG LW tournament but not only are we having a hard time stopping talking about it but we are also way behind on the relevant posts! Incoming! BOOM! Boom! Where did the supporting sappers go? So I finally had a 180 moment, where I wanted to start early war...I think it was a combination of playing World of Tanks, and seeing some Early War germans painted up on the Flames of War website. So here is my first attempt at an early war colour scheme. The tank isn't done but the colours are where I want them.